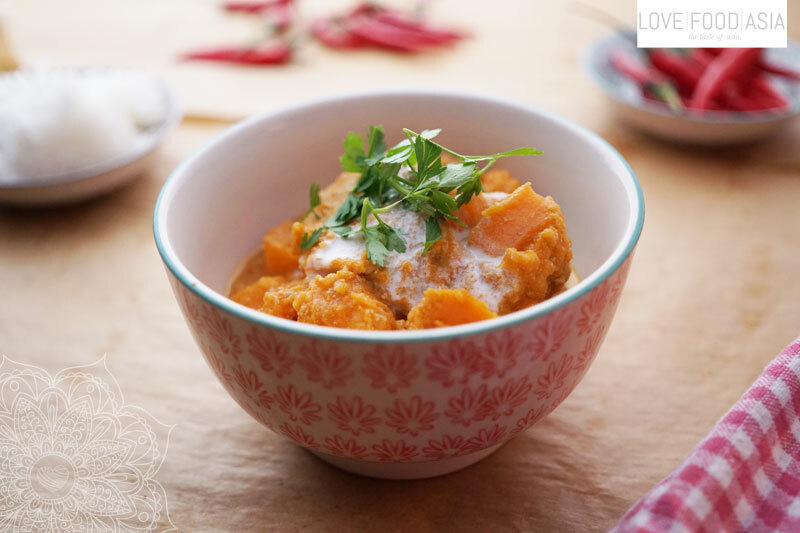 In this version of an Thai classic we used sweet potatoes to make the curry very creamy. In combination with thin slices of pork loin you can create a very special meal to surprise your guests. Use coconut cream instead of milk to make the curry even more creamy. Heat oil in a saucepan and stir fry ginger and onion until onion is golden brown. Deglaze with coconut milk and veggie stock. Stir in red curry paste and bring to a simmer. Add potato dice, lemongrass and kaffir limes leaves. Simmer for 8 minutes. Now add pork fillet slices and simmer for 4 more minutes. Taste with fish sauce and serve with rice and fresh Thai basil leaves.